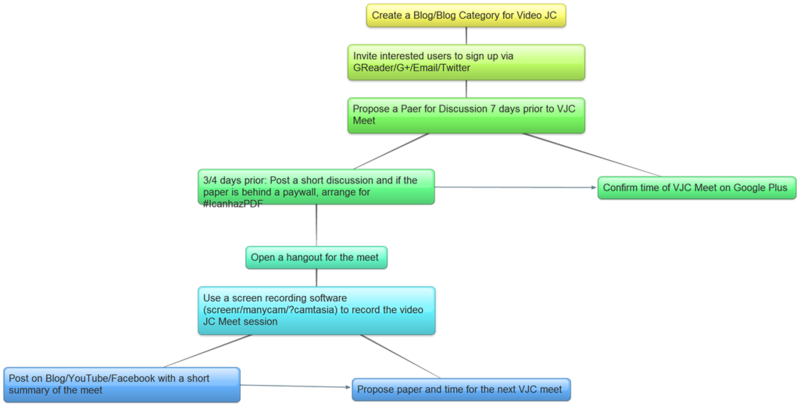 Google+: After #TwitJC, Time for #VidJC? Proposing a Model! Dr. Ves Dimov asks an important question via When are you starting a Journal Club on Google Plus?. And I am interested because using social media for medical education is one of my prime areas of interest. In response to one of my posts, Dr. Arin Basu left his proposal to use Google + hangouts as a Video Journal Club of sorts. That set me off thinking about this and when I read Dr. Ves’ post, I was pretty keyed up and decided to make a model of the same a la Dr. Neil Mehta. Tags: Google, Google Plus, Journal Club, Medical Education, VidJC. Bookmark the permalink.